At that same exhibition, painting brought together the most diverse works and most contradictory, from Puvis de Chavannes to Paul Sérusier, from Carrière to Burnand, (7) and even from Lameire (8) to Marcel Lenoir. (9) What painter’s imagination has not been aroused at some time by religious emotion? But it was mostly a matter of easel paintings. Decorative work can't be shown in an exhibition. Moreover, few painters have been given the occasion of realising a whole schema, to undertaking the decoration of a whole church! He who writes these lines passes for being privileged, as he has painted a chapel which is no longer in use (Sainte Croix du Vésinet), two little cupolas in the parochial church of Vésinet, and St. Paul’s at Geneva. Albert Besnard decorated the chapel at Berck; Mlle. D’Anethan the little church of Boffre, in the Ardèche. We are aware of the great work of M.Henry Lerolle in Caen, Dijon and Paris; that of Paul-H, Flandrin at Jerusalem and Rouen. Messrs. Aubert, Moreau-Néret, Merson and Pinta have painted murals. It was M. Aubert who decorated the church of Nôtre-Dame des Champs. M. Merson executed the mosaics of the apse at Sacré Coeur. 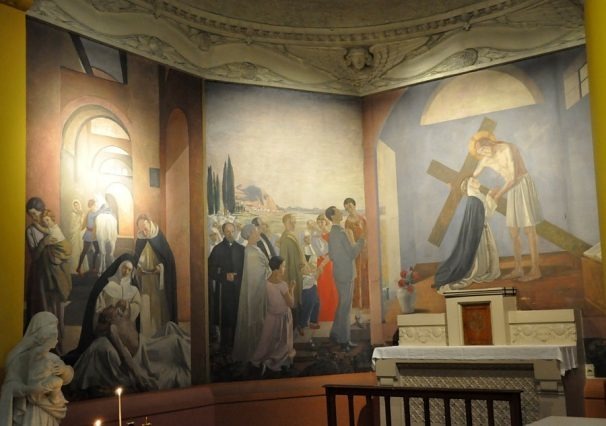 M. Maxence produced paintings and mosaics for the basilica of Lourdes. But neither M. Desvallières nor Mme. Lucien Simon, (10) true innovators, have received commissions from any church. Desvallières’ works shown at the salons: Christ at the Pillar, The Good Thief, The Banner of the Sacred Heart are not only pathos-filled images and fervent acts of faith, but also admirable decorative pages, composed, constructed, solidly written. How has the apologetic value of such work, shining with lyricism and power, escaped our priests? They whom the war found ready to make any sacrifice, have they not found in Desvallières the painter of the Man of sorrows and heroic Christianity? 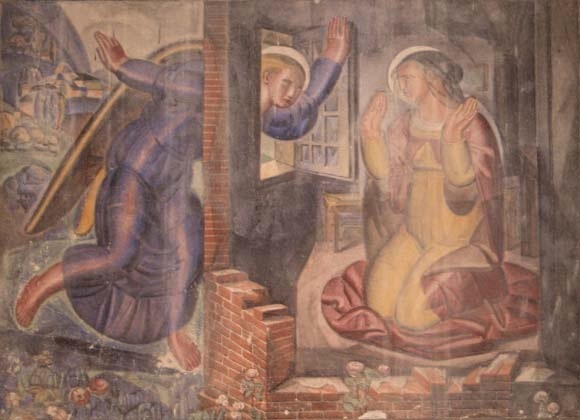 Mme Lucien Simon’s art - her Annunciations, Madonnas, angels - would be suitable by their qualities of tenderness and joyous candor, to chapels dedicated to the Virgin Mary. 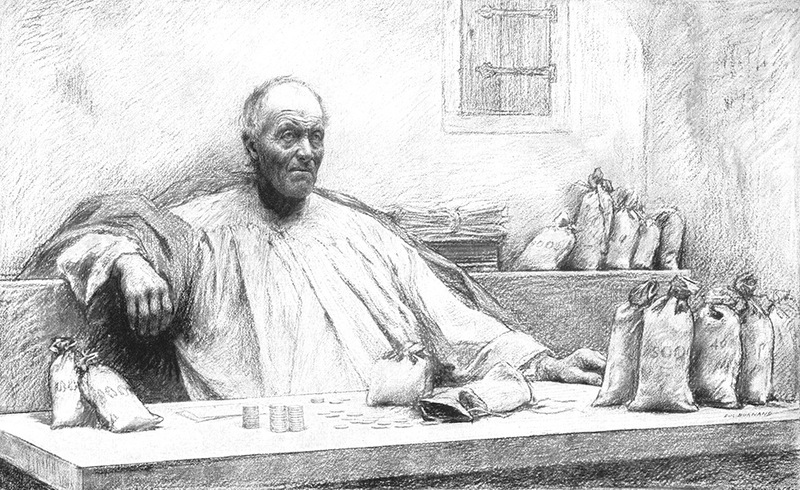 (7) Eugène Burnand, 1850-1921 Swiss painter with a naturalistic style, especially known for his book, Les paraboles, illustrating the parables of Jesus (http://www.eugene-burnand.com/Parables/Parables.htm). (8) Charles-Joseph Lameire, 1832-1910, architect, painter and decorator, contributed to eg the basilique du Sacré-Coeur (1874), the cathédrale Saint Front de Périgueux (1872), the Madeleine in Paris (1889), the chapelle Saint Louis des Français in Loreto (1895), Notre Dame de la Garde and the basilique de Fourvière, in Lyon (1897). Argued for the church artist's engagement in all the visual arts. (9) Marcel-Lenoir, 1872-1931, pseudonym of Jules Oury, fresco painter, associated with the symbolists and the Salon de la Rose-Croix in the late nineteenth century, author of an ambitious series of frescos on Christian themes done during the 1914-18 war with a team of apprentices in Bruniquel in the commune of Quercy in the Dordogne.